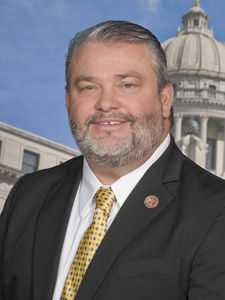 William Tracy Arnold (born February 14, 1969) is a non-denominational Christian pastor and a Republican member for the District 3 seat in the Mississippi House of Representatives for Alcorn and Prentiss counties in the northeastern portion of his state. Since 2000, he has pastored the Vineyard Church in Boonville in his native Prentiss County. From 2003 to 2011, he was the administrator of the Vine Christian Academy. Arnold was elected to the state House in 2011 by defeating the Democrat Tommy Dexter Cadle, 3,899 (52.7 percent) to 3,496 (47.3 percent). The seat opened when the incumbent Democrat, W. J. "Billy" McCoy, did not seek reelection. In 2007, Arnold was defeated in his own challenge to McCoy. Arnold serves on these House committees: (1) State Library (chairman), (2) Accountability, Efficiency, and Transparency (3) Appropriations, (4) Banking and Financial . He voted to restrict abortion providers regarding licensing and the detection of fetal heartbeat. He supported the law to ban abortions after twenty weeks of gestation and to permit "wrongful death" lawsuits regarding the loss of the unborn child. In 2017, he voted to authorize additional methods of execution in Mississippi and to classify the killing of first responders as first-degree murder. ↑ 1.0 1.1 William Tracy Arnold. Billstatus.ls.state.ms.us. Retrieved on October 9, 2017. ↑ Tracy Arnold's Biography. Project Vote Smart. Retrieved on October 9, 2017. ↑ Mississippi State Election Returns. Mississippi Secretary of State (November 8, 2011). Retrieved on October 9, 2017. ↑ Tracy Arnold's Voting Record. Project Vote Smart. Retrieved on October 7, 2017. This page was last modified on 7 May 2018, at 10:06.